GOOD leader Patricia de Lille laid a complaint with the Public Protector on Thursday over what she alleges is an investment and kickback scheme in the DA-led George municipality involving a councillor and his son. However, Western Cape MEC for Local Government, Environmental Affairs and Development Planning Anton Bredell, says De Lille's claims are unfounded. De Lille described corruption as a "national disease that has infected all levels of the state, from municipalities to provincial and national departments and state-owned companies". 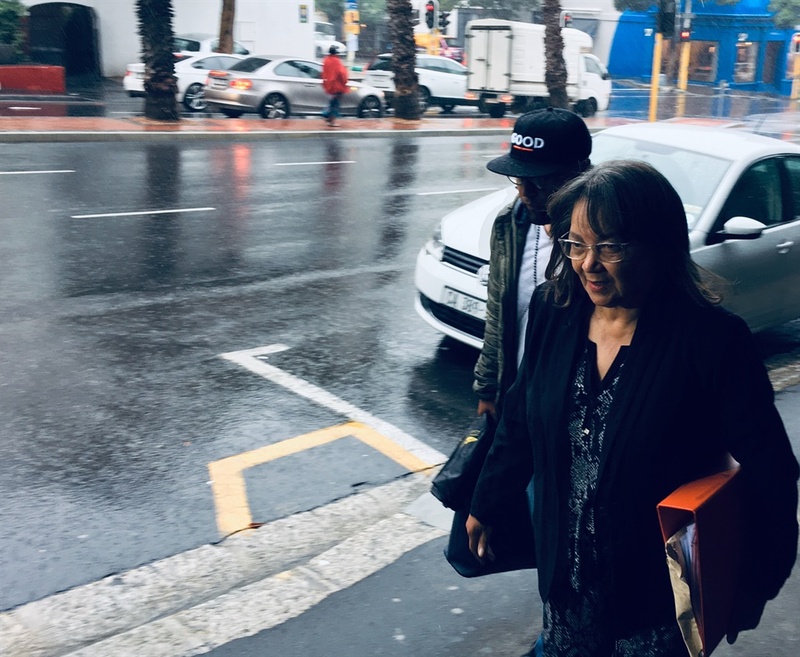 "This week, I was once again approached by ethical members of a government administration who are concerned about politicians in their midst," De Lille said to journalists in the lobby of the Public Protector's offices in a rainy Cape Town. "South Africans are sick and tired of hearing about politicians and their family members soliciting 'facilitation fees' – also known as backhander payments or kickbacks – for their personal or party benefit." She said it has emerged that such a "kickback scheme" has been operating in George in 2017. "Evidence of the scheme has been repeatedly reported to the provincial government which has failed to act against its members," De Lille alleged. According to De Lille, evidence shows that the municipality invested R350m of its reserve funds at financial institutions, and that handling fees were paid to the son of a George councillor, amounting to close to R400 000 in the first six months of the project. She pointed out that the Municipal Finance Management Act stated that no fee, commission of any reward may be paid to a councillor, municipal official or to a spouse or close family member of a councillor or official. As part of De Lille's submission to the Public Protector, are reports on an investigation into the conduct of the chief financial officer (CFO) of George, Keith Jordaan, by Schröter and Associates Attorneys. On the face of it, the chief financial officer of the George Municipality abused his position to ensure that Old Mutual Wealth be appointed as investment manager without the normal supply chain procedures being followed. The documentation further seems to indicate that the son of a George Municipal Councillor gained financially from the agreement. It seemed that there was an effort to cover up the above by replacing the agreement with a different one which did not contain the name of the councillor. The report further recommended that the matter be referred to a law enforcement agency and disciplinary action be taken against the CFO and the councillor. A later report by the same attorneys, dated December 3, 2018, stated: "On the face of it, the CFO committed various breaches of the Cash and Investment Policy as well as financial misconduct in terms of Chapter 15 of the MFMA (Municipal Finance Management Act)." The council also asked FTI Consulting to investigate the matter. In a letter to FTI Consulting, dated November 7, 2018, Municipal Manager Trevor Botha wrote: "The Speaker has indicated that he, in terms of item 13 of the Code of Conduct, is not of the opinion that he is satisfied that [the] councillor has transgressed the code of conduct. Botha stated that FTI consulting should therefore "cease any further investigation" into the councillor's conduct. At a "special council meeting" on November 19, 2018, the council decided to suspend Jordaan and institute disciplinary proceedings. According to De Lille, he is currently in his post. "No person deserves a cut of taxpayers' money because they or a family member is in government. Corruption reduces governments' ability to deliver services," De Lille said. "The ANC, EFF and DA must stop protecting corrupt politicians. The wheels of justice must be allowed to turn, so that the corrupt can be sent to prison, not Parliament." Bredell said in a statement said he noted De Lille's comments. "Sadly, Ms De Lille has made unfounded statements that are devoid of fact," he said. "If Ms De Lille cared anything for the rule of law, or at the very least cared for the truth, she would have contacted me or the municipality in question to determine the facts first." He said the provincial government was fully aware of the allegations. "A criminal matter has been reported to the Directorate for Priority Crime Investigation (DPCI) in George – known as the Hawks - and the provincial department has been in frequent contact with the DPCI in this regard. "In addition, the municipality has procured the services of a forensic firm to investigate the allegations and the provincial department is further aware that the Municipality has in fact, already initiated disciplinary processes against the implicated municipal official." He said the provincial government was also aware that the Special Investigating Unit (SIU) might explore the possibility of a proclamation into the matter if there is sufficient cause. "While I am fully aware of the election season and the need to score cheap political points by grandstanding I would urge politicians to act responsibly and at the very least, desist from spreading unverified rumours. It's simply not a good idea," Bredell added. "In the Western Cape, we believe in sticking to the rule of law and not play acting in the court of public opinion." News24 also requested comment from the George municipality, which will be added once received.